Spain is worldwide famous for being a country full of colorful fiestas all year round and clearly Barcelona is no exception. Among the several festivals you can enjoy in the Catalan capital, here are three suggestions for photographing festivals in Barcelona: the Saint George’s Day, the Gracia Festival and the Merce Festival. Three rich and colorful not to miss events if you wish shooting some great images of street photography while visiting one of the most exciting European destinations. One unusual feast you surely can enjoy by shooting interesting images is the Diada de Sant Jordi (Saint George’s Day). 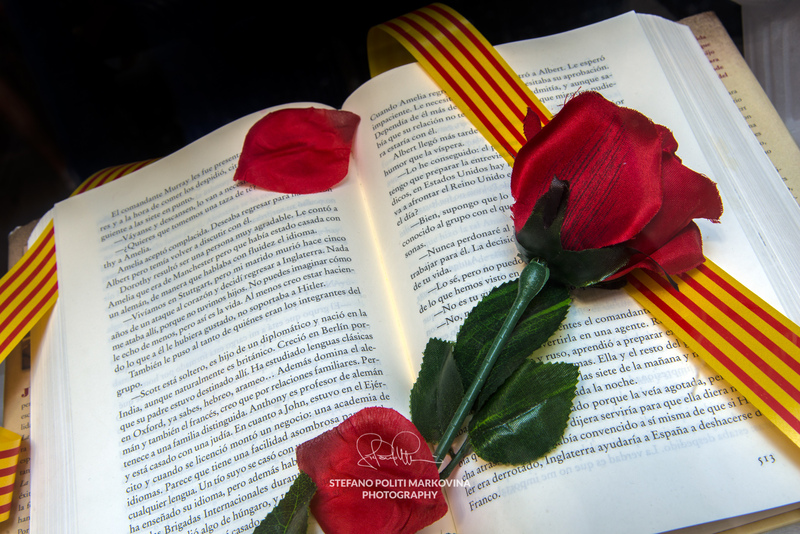 The Diada de Sant Jordi is a Catalan holiday held each year on 23 April. It’s known also as El dia de la Rosa (The Day of the Rose) or El dia del Llibre (The Day of the Book). The main event of this festival is the exchange of gifts between sweethearts, loved ones or colleagues. Men gave women roses, and women gave men a book to celebrate the occasion a rose for love and a book forever. 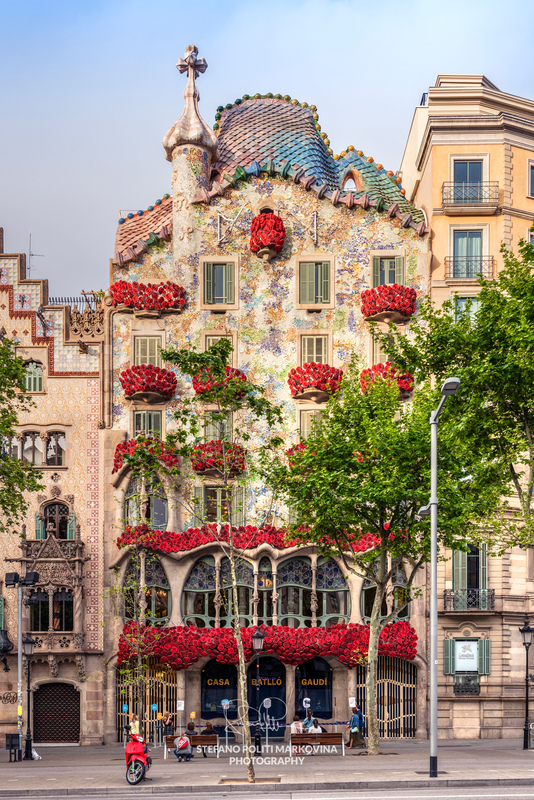 In the streets and squares of Barcelona, you will see hundreds of colourful flower kiosks selling roses next to bookstalls hastily set up for this special day. Stroll along the famous Rambla pedestrian mall to find the most interesting ones for a picture. Though roses have been associated with this day since medieval times, the giving of books is, instead, a more recent tradition originating in 1923. In that year, a Barcelona’s bookseller started to promote Saint George’s Day as a way to honour the simultaneous deaths of two among the greatest men of literature worldwide: Miguel de Cervantes and William Shakespeare, both deceased on April 23, 1616. Wandering around Barcelona’s streets for shooting photos you might find it difficult to see a woman without a rose in her hand, or a man walking by without a book! A not to miss summer appointment in Barcelona is the Festa Major de Gracia (Gracia Festival). It’s the biggest street festival in Barcelona and takes place every year in the Gracia district between August 15 and 21. Local streets ad squares are decorated by locals with beautiful and colourful artistic creations made with recycled elements while there’s even a competition for the best decorated balcony in the neighbourhood. This gives you the opportunity for plenty of photos during this impressive “fiesta”. If you want to take pictures of the decorated streets try to be there at dusk when the street lights and the lights of the single decorations are already on but without too much people around. The correfocs (fire-runs)are most striking features of this festival. They are a group of individuals are dressed as devils and they carry light fireworks fixed on devil’s pitchforks or strung above the route. Dancing to the sound of a rhythmic drum group, they set off their fireworks among crowds of spectators. Some of the spectators that participate dress to protect themselves against small burns and attempt to get as close as possible to the devils, running with the fire. 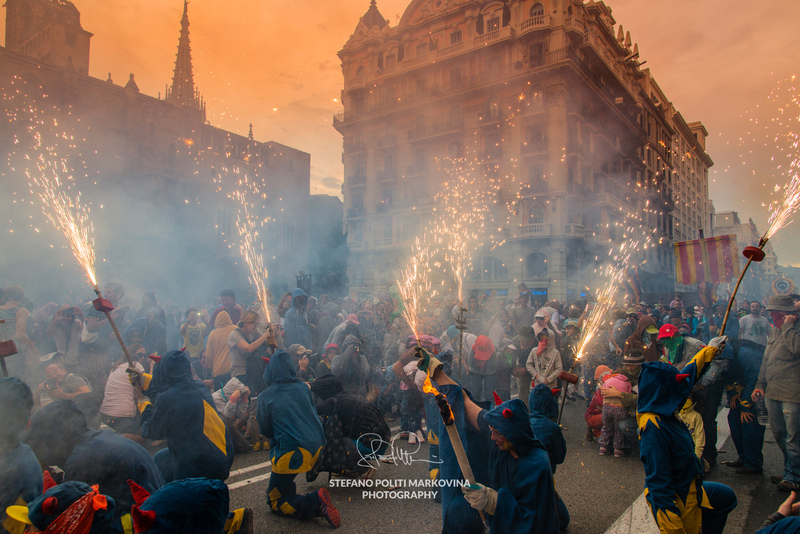 If you decide to shoot photos during the correfocs‘ parade, try to protect your camera and follow these useful tips. La Mercè is the most famous annual festival in Barcelona. Although the actual feast day is September 24, the festivities begin a few days beforehand. There are hundreds of events spread throughout the squares, streets and parks of Barcelona. All entertainment is free. Some of the most important features of this festival include parades of papier maché “giants” known as gegants i capgrossos (giants and big heads) with mythical characters and traditional drumming. 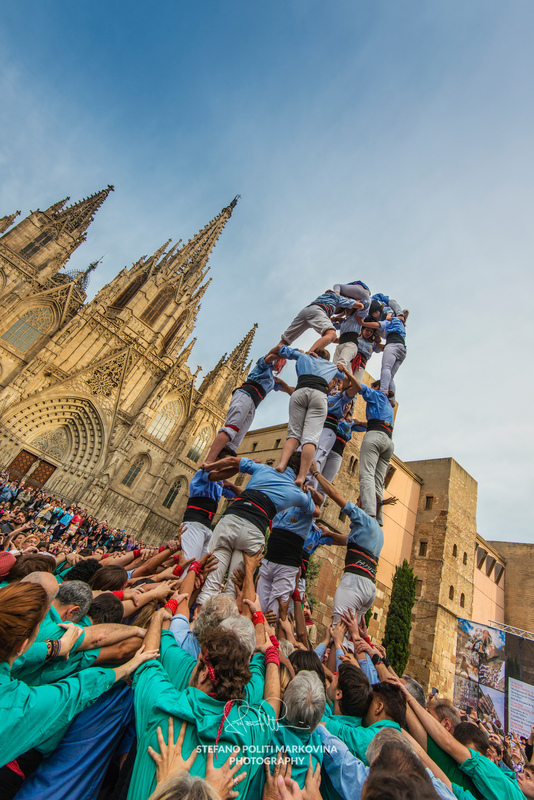 A not to miss event during the Merce festival is the Castellers’ exhibition while performing a castell (human tower). The castell has been declared by UNESCO to be amongst the Masterpieces of the Oral and Intangible Heritage of Humanity. Definitely, you get great chance to shoot some great photos if you are in Barcelona in those days.